That would be the NC-GOE. Just to set the record straight, we weren’t protesting. We were counter-protesting. 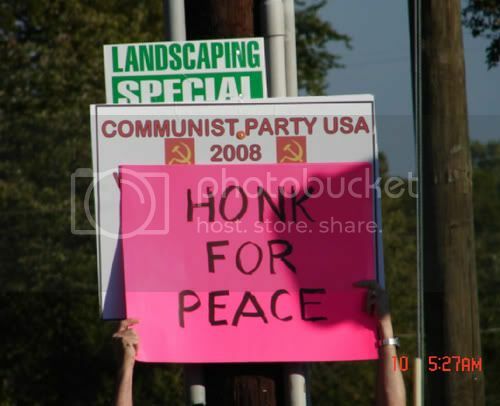 In other words, we were there to make sure that the communist’s freedom of screech was not presented unopposed. Who are all those people with the flags? That’s those Gathering of Eagles, a bunch of old veterans. I’ve seen their website, it’w awful. They’re going to put pictures of us and call us commies. Why can’t those old fools leave us alone? Also, anytime I have something to say to you commies, I’ll put it in one these light blue hilite boxes. Numbers: It seems everyone always wants to know about the numbers. Head counts are something I never remember to do, but others tell me it was 42 to 31. That’s 42 commie moonbats, and 31 patriots. So my original estimate of 30 from mid-last-week appears to have been more accurate than the RPD’s prediction of 300. But that’s the way it always goes, we never know what’s going to happen till it happens. I’m happy to report that Rolling Thunder accounted for a substantial portion of that number. The answer, of course, was “We dont think so”. We abandoned Capital property and moved across the street to the sidewalk where the Capital Grounds Police had no jurisdiction. That was just as good, actually better. When the anti-Americans (oh, sorry. I meant commies) began their parade they had to pass right by us, so that worked out just fine. 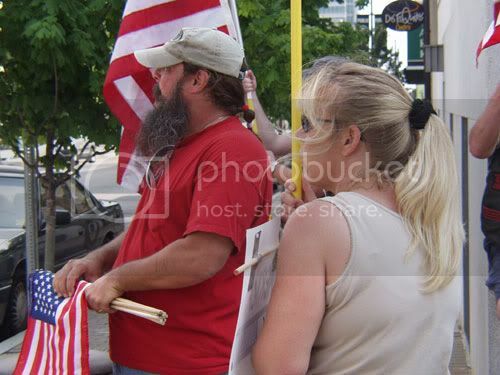 They marched around and through downtown chanting slogans and waving their anti-American signs (no flags, American that is). 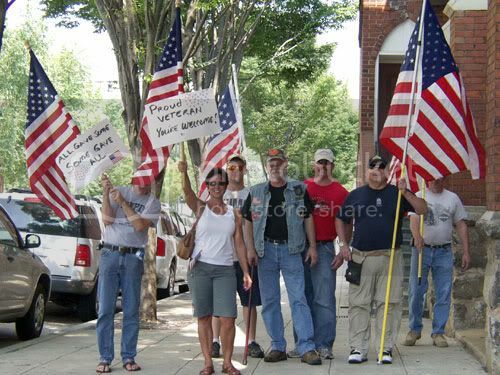 Moonbat Quiz: Since you came to protest the war in Iran, Iraq, Afghanistan and anywhere else Americans fight for freedom; Why did you spend so much time chanting “Exxon/Mobil go to hell”? Why so many anti-capitalist speeches? Why were some of you carrying signs about home foreclosures? I get the impression that it’s not just war you dont like, I think you have a problem with anything and everything American. What happens if you (and the rats you hang out with) get your way and capitalism is destroyed? 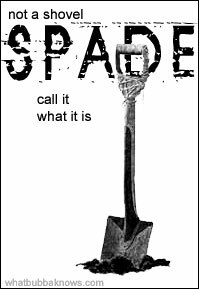 What’s gonna take it’s place? Socialism? And what do we call institutionalized Socialism? Funny how that keeps coming up, eh? We followed them, with flags. Each and every person on the streets and sidewalks that witnessed their passing were informed by the Eagles that the previous Hate-America message was brought to them by the American Communist Party. At least one restaurant had windows on the sidewalk, so we entered the restaurant and made the same announcement. Hey, just trying to help. 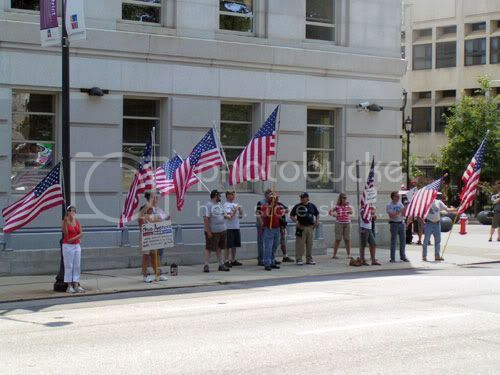 When they (the commies) stopped (in front of the courthouse and in front of the Obama HQ) to chant and give speeches, the Eagles used the opportunity to move in close and add to what was being said. 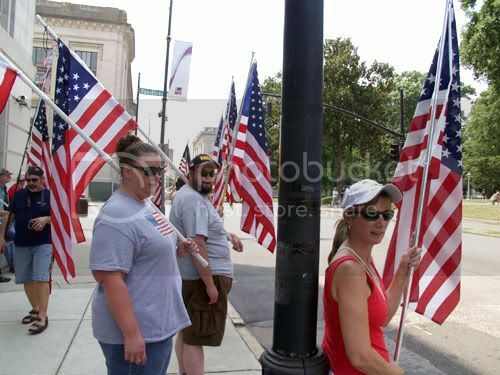 We pointed out that none of them had an American flag and offered to provide one. 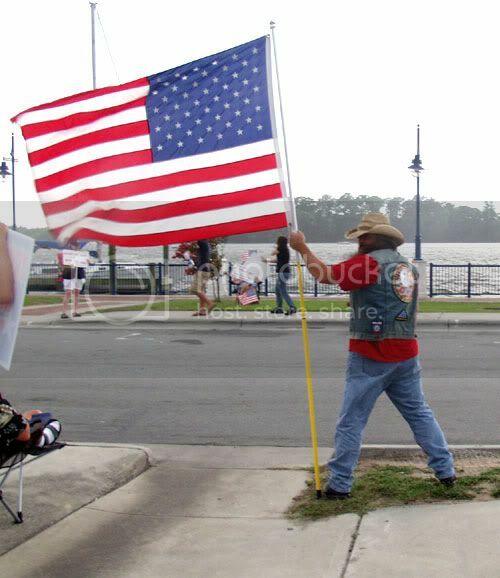 At one point, one of us walked into the middle of their sidewalk rally and offered a 3×5 American flag and pole to the leader of the group. 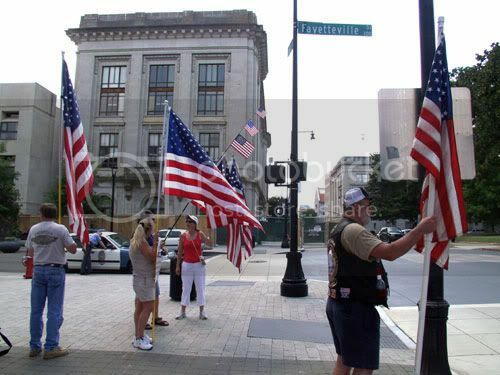 The flag was offered to seven different people, six declined even though their hands were empty. 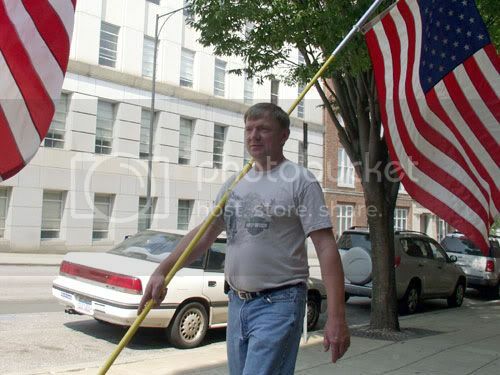 The seventh person took the flag. Of course, all this made the police very nervous and we were asked to move away …. again. After that, it all sorta fizzled out. By the time they returned to their original rally point – with less than half their original numbers – it didnt seem worth the trouble any more. We made a couple more offers on flags. The offers were declined, except 2 little 6-inch flags were accepted. And that’s the way it was, sez I. The remainder of our numbers gathered for a group photo and recited the Pledge of Allegiance. Why is there always some bozo with a Mercedes sign? For those among you that have actually ever heard of F.I.S.T. before this week, have any of you ever wondered what exactly is FIST for and/or against? So, what Imperialism are they fighting? What emperor do they seek to dethrone? Personally, I have to assume this is a reference to America as the Empire. If America is an Empire it is a very poorly run Empire. Are they speaking of America the Empire that (after being attacked, losing the majority of our Pacific fleet) whipped the Japanese, invaded and occupied their country? Then rebuilt their cities, society, infrastructure, established democray and then gave it all back to them and left? That’s no way to run an Empire. Or are they talking about America the Empire that stomped the Nazis (the murderers of millions), ran them out of France, Spain, Africa, Poland, etc. etc., then rebuilt the cities, societies, infrastructures of Europe – and gave it all back to the original owners and then left? That’s no way to run an Empire. (all screen-captured from the website). 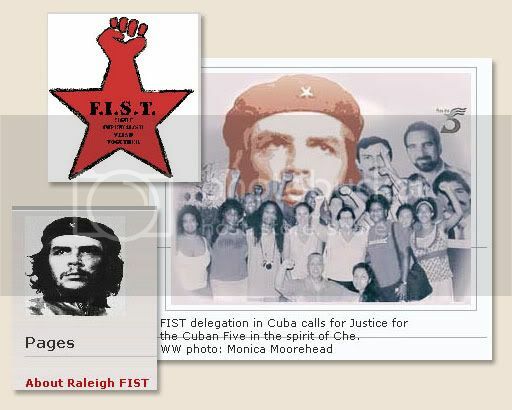 The FIST logo is a red star. I dont think it’s any coincidence that the logo resembles the Soviet and/or Chinese Communist star. Especially considering their adoration of Communist murderer Che Q., whom they lovingly refer to as the ‘revolutionary hero’. They’ve even sent delegations to Cuba to worship at the Shrine of WormChow. Moonbats: Have you ever looked into the whole story of Che? Do you not know that he was responsible for the murders of thousands of innocent civilians? Men, women and children? 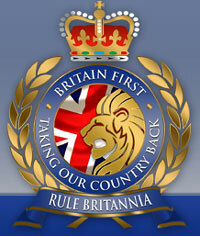 He proudly claimed to have personally shot scores of unarmed and bound people in the head, point blank. Ernesto “Che” Guevara was nothing more than a cold-blooded, serial murdering coward. And knowing what kind of person Guevara really was, and how he is worshipped by people like FIST, shouldn’t you reconsider being seen in public with them? Add to the star and the Che worship the fact that the FIST websites contain a multitude of articles eschewing the blessings of communism and socialism, is it not fitting to refer to them as commies? Furthermore, why do they get angry when we call them what they are? Well, it was an interesting day today. A group of antiwar people announced a couple of weeks ago that they’d be holding an antiwar rally in Raleigh today. A rally against the war with Iran. Now, I don’t read or watch the news all the time, but enough so that I felt if we’d gone to war with Iran I would almost certainly have heard of it by now. Or it’d be on the Net somewhere at least, but no, I’d heard no peep of any declaration of war, or for that matter, debate in Congress about funding such a war, and neither of the presidential candidates had been talking about it (and they talk about EVERYTHING, damn but I’m tired of this campaign already! ); so I reached a tentative conclusion that this was some kind of antiwar-in-general, conspiracies-everywhere paranoid reaction by some especially unsettled people. Since the protest was scheduled on the same day and on the same grounds of the capitol that my local Viet Nam vets’ group was holding its monthly memorial ceremony, it seemed reasonable for a few of us to hang around to make sure nobody did anything to the memorial. And maybe watch the protest, act as a counterprotest if that turned out to be appropriate. The affair was supposed to start at 2PM, but there was hardly anyone there at that time. Slowly, over maybe 20-25 minutes, a group of about 30 people assembled, of which maybe 2-5 were people over 55 or so, and everyone else was under 25. (Didn’t count the half-dozen little kids, 6-10 maybe, who they had with them.) 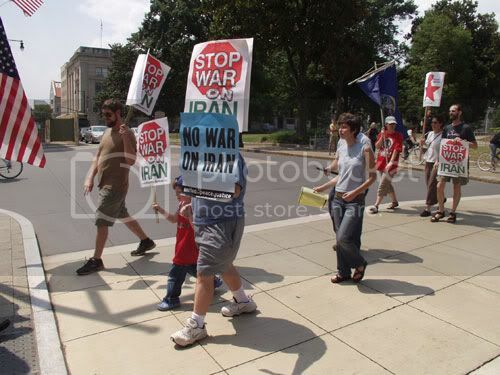 Some nicely made signs about No War With Iran were carried by a dozen of the attendees (including a couple of the little kids- I’m confident they had been taking classes in History and Politics and were therefore informed, intelligent, committed protestors). I walked down the main street a few blocks just to check out what else might be going on, found a TV crew interviewing a young lady in a bright orange T-shirt with “impeachbushcheney.com” on it, and two older guys with “Vets For Peace” T-shirts. 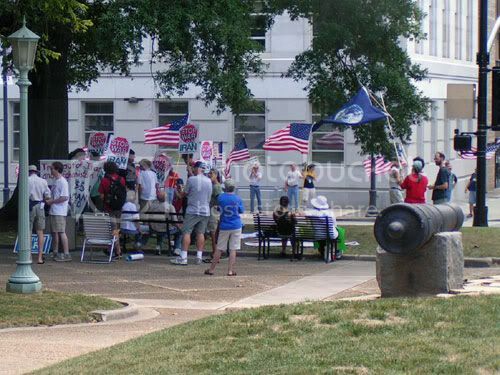 When I got back to the capitol grounds, the local police had already drawn a line between the protest area and where the vets were at the Viet Nam memorial statue. 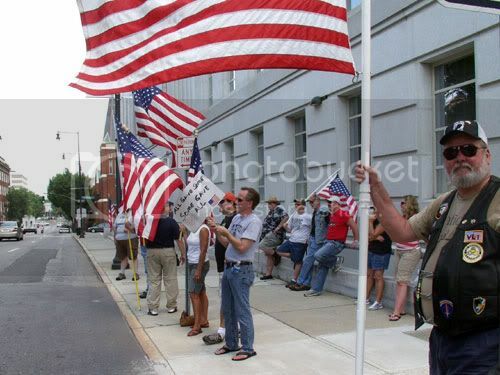 There were about 30-40 vets in the group, from several organizations like Rolling Thunder, my local group, and others, and also at least one Blue Star Mother. (A lovely lady who’s very active in supporting the troops in any way she can.) 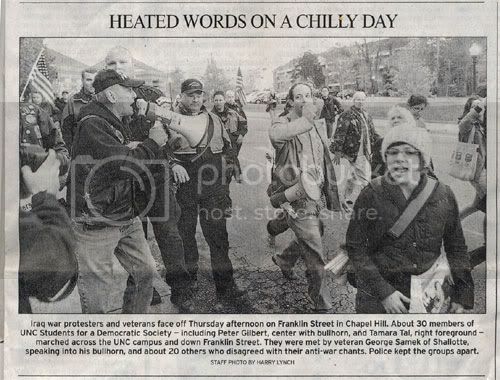 The police were nervous about possible violence, but once they saw how cooperative the vets were, they relaxed, and allowed some of them to carry their flags across the street from the antiwar people in a counterdemonstration. 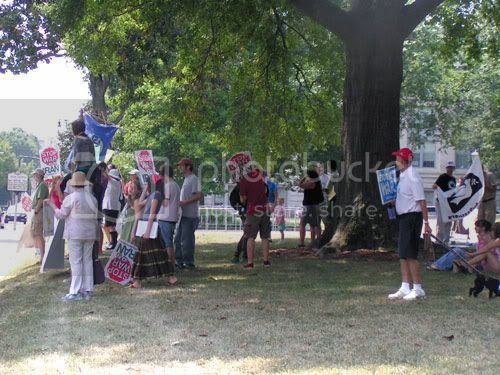 I blended in with the crowd and got to the antiwar area. By then the biggest sign had come out (a two-person job to carry and display) which had on it the message I thought would show up- “All US Troops Out Of Iraq And Afghanistan”. And there was literature being handed out from F.I.S.T. 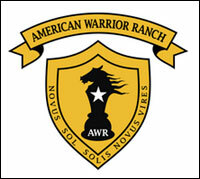 (Fighting Imperialsm, Standing Together), one of the organizations that sponsored the event (the other being Code Pink). The literature was fascinating, since it mentioned (among many things) that the shameful history of US imperialism is well known to go back many, many years, for example, our involvement in WW1 and WW2 were primary examples of imperialism. It also mentioned how awful it was for the US (never mentioned the UN or European countries) to be trying to interfere in the sovereign nation of Iran, who had every right to develop nuclear weapons if they wished, since after all, they were being threatened by the US and Israel and needed to be able to defend themselves. I realized then how mistaken I’d been, to be under the impression that it was actually the Iranian president who’d been threatening Israel, and that I’d somehow missed the news articles about Israel aggressively going after Iran. Those Israelis are tough, with their population of maybe 7 million, to want to take on Iran (which is not exactly across the street) with its population ten times greater. 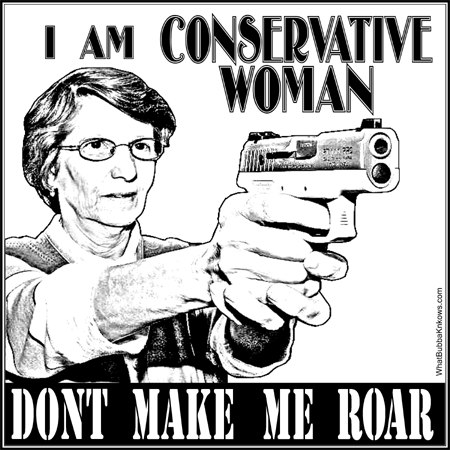 Meanwhile, the Blue Star mother had blended in with the protestors, and listened to the young ladies around her whining about those nasty old vets with their flags across the street, marring their perfectly good and righteous protest, why can’t those old fools leave us alone? Apparently the Free Speech thing is kind of like some streets are– that is One Way. 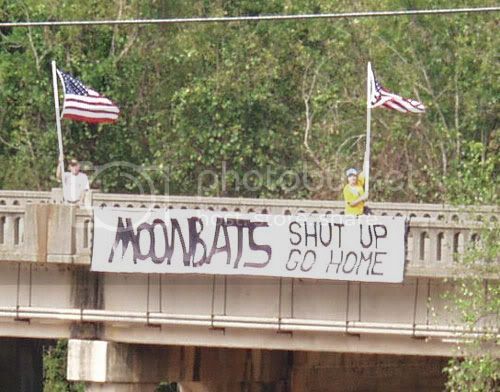 We righteous protestors get to express ourselves, but you other jerks need to stay home and let us do our thing without a hint of opposition. Finally, after some of the traditional chanting of antiwar slogans and a mildly inflammatory and really creative (as in, totally made-up statistics about how bad we are) speech by one of the protest leaders, the group proceeded to march down the main street to the Federal Building for a brief show there, after which they were to make their way to the local Obama HQ. So they marched away, chanting some more, at which point I and the rest of the vets decided that was enough, the memorial was safe, it was a hot afternoon, and we were all ready to go home. But the important work of the protestors was accomplished. There were several interviews of them by TV crews, and none that I saw of any of the counterprotestors, although I heard later there might have been just one. 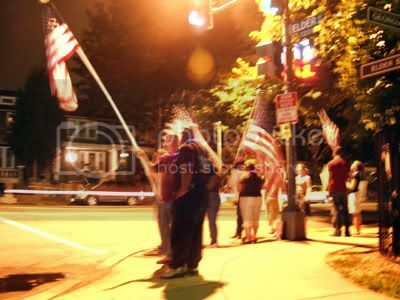 No doubt the protestors will be on the evening and nightly news, even though in fact it was a tiny demonstration, countered by at least an equal number of veterans and troop supporters. That’s our media, serving us so well. And that’s all, folks. Till next time…..
August 2nd, 2008 under Uncategorized.